Girls or couples weekend specialists. Family friendly - complimentary highchair, port-a-cot and toy room. 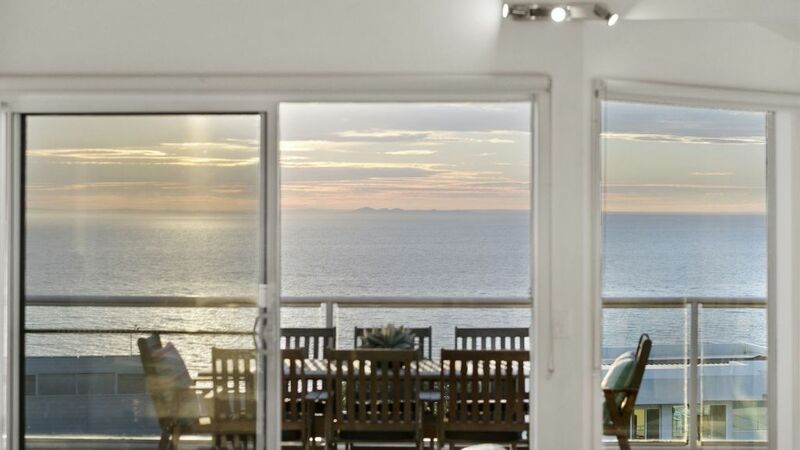 Sweeping views of Port Philip Bay - enjoy breathtaking sunsets all year round! Please note our calendar is always up to date so if you can't successfully put your dates into the enquiry page it means those dates are already booked. Relax on our soft leather couches with plush throw rugs in front of the fire whilst watching the sunset over Port Phillip Bay. Revel in the tranquility of the quiet seaside street, sleep peacefully in our comfy chiropractic beds with velvety soft linens (400 thread count or above) and warm snuggly quilts. Cook up a storm in our fabulously appointed kitchen or skip the cooking altogether and visit one of the many nearby wineries/restaurants and come home to the centrally heated and air conditioned home to gaze out the floor to ceiling windows at the Melbourne city skyline, awash with evening lights. Visit the nearby beaches or take a walk through Mount Martha Park a short distance away, catch a movie at the Dromana drive-in or the Mornington cinema. Soak up the local culture at the Red Hill or Mornington racecourse craft markets or take a stroll down Main St Mornington for some boutique shopping and a long lunch at one of the many cafes or hotels. Play some golf, enjoy a massage or a dip in the healing waters of the Peninsula Hot Springs just 15 minutes away. Or catch more spectacular views from the new gondola at Arthur's Seat Eagle. Take advantage of over one hundred DVDs in house for you to choose from, play the Nintendo Wii or show off your skills on the foosball table ... or simply enjoy a wine or two on the massive deck overlooking Port Phillip Bay. And of course the beach is just minutes away - Mt Martha South Beach, Safety Beach, Dromana/Blairgowrie/Rye beach, or visit Portsea/Sorrento (15-20mins). We've even taken care of the kids for you - books, blocks, Thomas train tracks, games, puzzles all in their own rumpus room with TV, DVD player with kids' DVDs, Nintendo Wii and foosball table. The house sleeps 11 so we cater for all your guests! We have approximately 20 place settings of quality crockery/cutlery etc, and everything you may need for a dinner party/BBQ including an electric mixer, Bamix, platters, multiple saucepans and frypans, sharp knives and glassware. For the littlies we have a large assortment of plastic ware. Superbly appointed double storey 3-4 bdrms, 2 bathrooms, 3 toilets, 2 living areas. Fully fenced secure rear yard. Laundry with washing machine & dryer. ** Gas ducted heating throughout, Split system Air conditioning in open-plan living/dining, Ceiling Fans in every room. 20 minute drive to Peninsula Hot Springs and minutes to Peninsula's wineries, world class golf courses and mazes. 20 minute drive to the new gondola ride at Arthur's Seat Eagle, Dromana. We are a professional couple who have travelled widely, living among a diverse range of people and cultures, and we count many people from cities and countries we have visited as friends. Our interests include travelling, music, theatre and movies, reading, cooking and dining out, and activities centred round beautiful Port Phillip Bay - coastal cliff walks, swimming, catching the spectacular sunset over the water every day. At 'Atlantic View', our aim is to provide all the amenity and comfort we ourselves would like to find in a holiday home, against the backdrop of spectacular views, and we warmly welcome guests from all backgrounds and cultures to enjoy our lovely home as much as we do. Sweeping panorama of Port Phillip Bay, right round from Arthur's Seat at Dromana, to the heads at Point Lonsdale and Point Nepean, and on to Melbourne CBD. Glorious sunsets year-round! Our welcome pack includes introductory sachets of shampoo, conditioner, body wash and cakes of soap, as well as paper towels and toilet paper. Guests need to bring Aldi coffee capsules with them if they plan to use the coffee maker. There's a milk frother that can be used in conjunction with the coffee maker. The house is two-storey and the living area is accessible by a staircase from the ground floor. This was our second stay at Atlantic view and we came back specifically because of the memories we created in the previous year. The house was exceptionally clean and Margot and Ash went out of their way to make us feel welcome with chocolates on the table and a welcome back note. The house is well equipped with everything you’d need and you can tell it’s lovingly looked after. The dishwasher may need a service as it was a bit dodgy this time round but is probably the most used piece of equipment in the house! I’d suggest a blind over the window upstairs above the stairway as well as with the consecutive 30 plus degrees days it was extremely strong in the afternoon in that area. We were delighted when Irma and her group decided to pay a second visit to 'Atlantic View'. This lovely group of friends was a pleasure to communicate with before their stay, and at check-out, they left our home in immaculate condition. Sorry the dishwasher didn't perform so well - we'll be looking into it this week. Thanks also for the tip about a blind in the stairwell window, a great idea for summer heat waves! Overall we'd like to thank Irma and her friends for being the perfect guests - it was a pleasure to host you again at 'Atlantic View'! Great views but property needs improvement.The outdoor furniture needs renewing not safe to use, bbq very rusty. Needs detailed cleaning on balconies, glass which had alot of cob webbs, kitchen drawers were not clean and found cups in the pantry not washed properly with coffee stains. The ensuite/ toilets did not have locks not ideal with 2 families. Water pressure was very low and could only open 1 tap at a time, had to organize our showering times. Downstairs needs an air con, specially for hot days. We were surprised and sorry to read Birsen’s comments, as our many guests have left overwhelmingly positive reviews. The spectacular views, the close proximity to the delights of the Peninsula, the comfortable amenities of the house are usually what guests tell us about. Cleanliness is actually something people comment on - “spotless” and “sparkling clean” - and our professional cleaners usually do a great job. I’m sorry that it seems in this case a few things have slipped under the radar (some coffee cups not properly washed, dust in some drawers, cobwebs on the balcony, the BBQ). We’ll certainly review our cleaning practices in regards to all these things. A couple of Birsen’s comments though seem unfair. All the outdoor furniture is safe and many people, including ourselves, have used them safely, even in the last few days. We have not installed locks on bathroom doors for safety reasons – we often have families with small children staying and feel locks on doors create risks. Regarding the comments on water pressure – this is outside any homeowner’s control. In heat waves, if a lot of water is being used in the area, the pressure will suffer. Water pressure’s never been an issue before. Unfortunately Birsen was staying through 2 of the hottest days this summer, and the whole area of Mount Martha suffered a power outage for some time one night. We’re sorry this happened, but we contacted the electricity company on Birsen’s behalf and also kept in contact with her, and she said they were comfortable. Unfortunately, these kinds of events are outside our control, and could happen to people even in their own homes. We’re sorry this family found problems, and will review cleaning practices for improvement. We pride ourselves on creating an excellent holiday destination for our guests, and will continue to do so as well as we can. A beautiful home to create beautiful memories! We stayed at Margot and Ash’s house to celebrate a milestone birthday. It was very homely and has everything you could ever need to spend a few days away. Perfect views and a convenient location to Mount Martha Village and all the other towns along the Mornington Peninsula. Super comfortable and clean facilities, would highly recommend for any family wanting to experience this part of the world. Thank you for staying at 'Atlantic View' Katrina! You and your family were perfect guests, enjoying your stay and then leaving everything clean and in perfect order at check-out. We were delighted to play a small part in your lovely family celebration, and would be very happy to welcome you to stay again! Absolutely amazing house and we were really looked after very well. The views were breathtaking and would highly recommend to others. We would definitely use the house again in the future. 10/10! Emmanuel and his family were perfect guests! They kept in touch throughout their stay, and at check-out everything was as neat as when they checked in. It's great to hear they enjoyed their stay, and we'd certainly love to host this nice family again! Wonderful views of the bay with a stunning sunset every night. Well equipped with kitchen equipment, crockery and glassware. Loved the big dining spaces inside and out. Comfy beds in the downstairs bedrooms. This is more of a recommendation (NOT a complaint) but if you intend on using the room with the foldout couch, bring an eye mask as the skylights let in the morning light. Lovely stay for us all. Margot is a fantastic host, great communication. Serena and her family were fantastic guests! They were respectful of our home, leaving everything neat and clean. They communicated very well before and during their stay, and were a pleasure to host. I'm glad they enjoyed their holiday (and thanks for the tip about light in the 4th bed/living room, we'll see what we can do to alleviate this!). We would love to host this great family when they're heading for a holiday on the beautiful Peninsula once again! We're glad Aletia and her group enjoyed the lovely views and comfortable set-up of our home. We would be happy to welcome them as guests again. Visit lovely beaches nearby for a full range of water sports, or walk in Mount Martha Park, a short distance away. If golf is your game, enjoy a round and the views at Mount Martha Public Golf Course or any of the other nearby clubs. The latest movies will be showing at the fantastic Dromana drive-in or Mornington cinemas. Looking for craft markets? Visit the Red Hill or Mornington racecourse craft markets, or stroll down Main St Mornington for boutique shopping and a long lunch. You can also browse antiques in Tyabb or Mornington, or enjoy a massage or a dip in the healing waters of the beautiful Peninsula Hot Springs, about 15 minutes away. Ashcombe Maze and the newly-refurbished and re-opened Arthur's Seat Eagle gondola ride are both only a short drive away. And of course beautiful Mt Martha South Beach is just minutes away. Then there's Safety Beach, Dromana, Rye, Blairgowrie, or a little further afield to Sorrento and Portsea (about 20mins). From Sorrento you can make a day-trip to Queenscliff and back on the magnificent ferry.